1. Which filter set should I buy for my system? Always check the part # on your user manual, and if the part # is not in the user manual, then type your system model # into our search engine. Once the item appears, scroll down to the bottom, and under the Accessories category, you will find the replacement filters for your system. 2. What is Reverse Osmosis and what types of contaminants does the Reverse Osmosis system remove? 3. How can I connect and/or disconnect the tube from a quick type fittings? 4. Adding a booster pump to your existing system? 5. What are the replacement filter part numbers for my Home Drinking Standard Reverse Osmosis System? 6. What are the replacement filters for my 6, 7, 8, 9 & 10 Stage Systems? If your system is 50 GPD, you will need 104550 plus the following: Otherwise, for 75 or 100 GPD and up, you have to go back to Q.3 and purchase your pre-filters and membrane separately. 7. What are the replacement filter part numbers for my Portable Reverse Osmosis System? For 4-Stage Portable system you will need one filter 104040 Plus 2 filters 104041 Plus you need a membrane 104092 for 50 GPD. 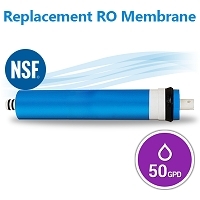 For 5-Stage Alkaline Portable system you will need one filter 104040 Plus 2 filters 104041 Plus one filter 104051 Plus you need a membrane 104092 for 50 GPD. For 7-Stage Alkaline Portable system you will need one filter 104040 Plus 2 filters 104041 Plus one filter 104180 or 104052 Plus you need a membrane 104092 for 50 GPD. 8. What are the replacement filter part numbers for my 5 stage Home Drinking Quick Change Reverse Osmosis System? Third Stage either CTO Carbon filter 104063 Or 1 Micron Sediment Filter 104060 (For high chlorine in the water choose CTO. For well water with high sediment, choose 1 Micron). 9. What are the replacement filter part numbers for my Home Drinking Reverse Osmosis System 101008, 101025L, 101058 & 101084 with special lager sized filter? 10. What are the replacement filter part numbers for my Aquarium Reverse Osmosis System? 11. What are the replacement filter for my 10" x 2.5" Whole house System? 12. What are the replacement filter for my 10" x 4.5" Whole house System? 13. What are the replacement filter for my 20" x 2.5" Whole house System? 14. What are the replacement filter for my 20" x 4.5" Whole house System? 15. How do you change your whole house pressure gauges. If you would like to install or exchange the old gauges with a new pressure gauges, please remove all the old Teflon tape from the pressure gauges and apply 4-5 rounds of Teflon tape in the clockwise direction. Please make sure the Teflon is not applied loosely otherwise leaking may occur. To install the pressure gauges onto the system, DO NOT turn the pressure gauges from the head otherwise you may cause damage. Instead, use a suitable wrench at the base of the pressure gauge and turn the pressure gauges clockwise 360 degrees about 4-5 times maximum otherwise you will damage/ crack the housing gauge hole. 16. Why Does the Water From My Reverse Osmosis System Seems Cloudy or Milky? The water out of my Reverse Osmosis system looks milky or cloudy, what is the reason behind this issue? This is generally caused by trapped air within the RO system. However, it will not affect the quality of your water. The cloudiness should disappear within a minute after water sits in a glass. This is a normal occurrence with a newly installed RO System or after a filter change. You can release the air from your RO system by draining the tank 1 to 2 more times or using RO makes humming noise air release instructions in your system manual (see below). If your RO system makes a whining or humming noise, most likely it’s due to air which got trapped in the “Check Valve” during installation. So we need to get rid of the air in the Check Valve. The Check valve is on the left side of the Membrane Housing. It is an internal valve encased in the L-shaped plastic fitting. It connects to the Clear line that puts out pure water from the Membrane housing. Step 1: Close the Tank’s valve. Step 2: Tilt the RO system to the right. Put something under the 3rd filter housing to keep RO tilted. This will help dislodge the air bubbles from the Check Valve. Step 3: Turn on the RO spigot. Let pure water flow thru spigot for about 1 minute. This forces the air to flow directly out to the spigot, bypassing the tank. Step 4: Turn off the spigot. Wait for about 10 seconds. Repeat step 3 again. Perform this step around 3- 4 times. Turn off the incoming feed water inlet line and open a faucet downstream of the unit to relieve the system internal pressure and also close the valve on top of the storage tank. Remove the tube from the fitting by pressing inward on the collet and simultaneously pulling the tube out of the fitting. Remove the collet from the fitting. Just grasp it with your fingernails and pull it out. Use a thin bladed screwdriver, a toothpick, tweezers, or some other thin tool to pull the o-ring out of the fitting. Be careful not to damage the fitting, but don’t worry about the o-ring. You're going to throw it away. Put the new o-ring into the fitting and push it into position with the end of the tube itself. (Don't use a sharp tool that could damage the new o-ring.) The o-ring should be pushed in so that it stands against the back wall of the fitting. When the o-ring is in place, reinstall the collet by simply pushing it back into the fitting. If the o-ring is slightly out of position, inserting the collet should fix it. You normally won't need to replace the collet, but it doesn't hurt.